BRIDGE VINEYARDS from Long Island scored a hole-in-one by having its 2007 Chardonnay and 2003 Estate Merlot featured at the prestigious U.S. Open golf tournament next month at Bethpage. The last time the Open was played on the Long Island course, Palmer Vineyards was the featured wine, as well as the source of a special U.S. Open labeled version which was a popular gift and souvenir. Greg Sandor of Bridge Vineyards has been working for a while with the United States Golf Association on this year’s event, with obviously great results. Bridge Vineyards has a tasting room in Brooklyn which offers wines from throughout New York State . The chardonnay and merlot will be featured at corporate tents during the Open. Senator Charles Schumer announced that other Long Island wines and farm products will also available in other locations—a great example of a “local” twist to an international event. This is an amazing opportunity to meet Kevin Zraly, the best wine educator in the industry today. And it is important to note that he is appearing in the Hudson Valley, where so much is really happening in food, wine, and agriculture. Called "the Hudson Valley's flagship winery" by The New York Times and "a great place to visit" by The Wall Street Journal, Millbrook Vineyards & Winery is conveniently located in the magnificent Hudson River Valley just 1.5 hours from both New York City and Albany. It is glorious to visit any time of year. Kevin Zraly, the founder and teacher of the immensely popular Windows on the World Wine School, and author of the Windows on the World Complete Wine Course, will bring an abridged version of his 8-part "Windows on the World Wine School" to Millbrook Winery this summer! Seating is limited so reserve now. 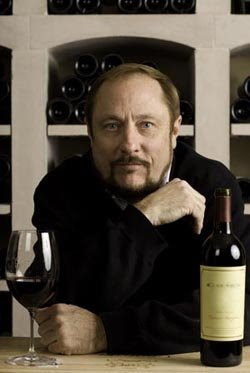 Saturday, June 13 from 5:00 - 7:30 p.m.
Kevin will discuss and taste through Pinot Noir wines from around the world. Includes wine and cheese reception. Saturday, July 11 from 5:00 - 7:30 p.m.
Kevin will discuss and taste through Cabernet Sauvignon and Cabernet Franc wines from around the world. Includes wine and cheese reception. Saturday, August 8 from 5:00 - 9:00 p.m. Discover your inner winemaker with this unique opportunity to create your own wine blend. After mastering the use of pipettes and graduated cylinders, your final cuvee will be bottled and corked in a 375 ml bottle complete with your own custom wine label. A 3-course dinner featuring Millbrook wines will floow the blending portion of this event. Cost is $125 per session or sign up for all three sessions for only $325. "Discovering Maryland Wines with John DiTomasso"
From boutique wineries to the two largest in the state, see how Maryland wineries harvest grapes, make and bottle wines. Learn the basics from Kevin Atticks, Executive Director of the Maryland Wineries Association, and experts from Basignani Winery, Boordy Vineyards, Deep Creek Cellars, Fridays Creek Winery, Linganore Winecellars/Berrywine Plantations, and Loew Vineyards. Order it via Amazon.com. The Patuxent Wine Trail is a comprehensive guide to Calvert County wineries that showcases the sophisticated tastes of local wines and the diversity of the county’s beautiful landscape. Ranging from north to south, from rolling farmland to creek-side retreats, the Patuxent Wine Trail winds through some of the region’s most stunning scenery. At each stop, the winemakers’ art is on full display, from vine to vat to bottle. 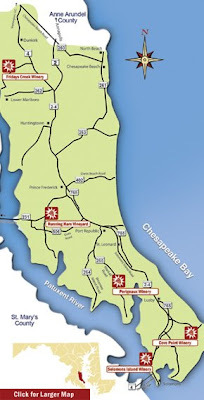 Calvert County is known as the Pleasant Peninsula, and you will soon see why after experiencing the sublime pleasures of the Patuxent Wine Trail. Part of historic Southern Maryland, Calvert County offers stunning water vistas and beautiful rolling farmland that soothes the soul. The region’s soil and climate are also a close approximation of the famed Tuscany region of Italy, and local wine makers are creating sumptuous award-winning wines to rival those anywhere. 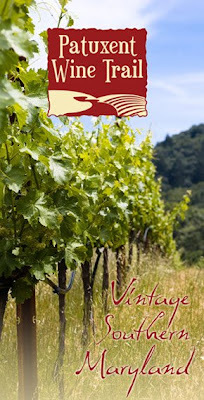 Visit www.PatuxentWineTrail.com to plan your tour. The 34th International Eastern Wine Competition (IEWC) took place 5/18-20 in Watkins Glen in New York’s Finger Lakes. Produced by Vineyard & Winery Management, a leading North American wine trade publication, the IEWC is one of the oldest and largest wine competitions in the country. There were over 1750 wines entered in the IEWC, with 40 Double Gold medals, 83 Gold medals, 517 Silver medals and 604 bronze medals. Regional wines made a strong showing, with New York dominating the top awards, winning three of five Best of Category awards for Best White Wine, Best Sparkling and Best Fruit Wine (a fruit wine made by Flickerwood in PA used NY fruit). In the Riesling Championships, a subset of the IEWC, Finger Lakes rieslings won two of four best in class awards (dry and semi-sweet), and the 2006 Tierce riesling won a “triple crown”; best dry riesling, Riesling Champion and Best White wine. Virginia and Maryland also placed with double gold medal wines; Potomac Point’s norton 2007 (Virginia’s native grape) and also Cooper Vineyards’ 2008 viognier were the top Virginia wines, with Sugarloaf Mountain’s red Bordeaux blend “Comus”2007 earning double gold from Maryland. Westbend Vineyards in North Carolina also won double gold for their 2006 Yadkin Valley chardonnay. Complete results are availalble online at www.vwm-online.com (link from the competition results link for IEWC on the righht of the home page). Visit richardleahy.com/blog/blog to post comments on this story. With this new style of sauvignon blanc emerging on the West Coast, where will the grape make its next big statement? My guess is, right here in our own back yard. A handful of Virginia wineries are making excellent sauvignon blanc. The best of them, from Linden Vineyards and Glen Manor, can stand proudly against competitors from around the world. Veritas, Barboursville and Breaux are nipping at their heels. Virginia's wet climate makes the grape tough to grow and even tougher to fit a style. "Some years we have left more than half our crop on the vines, because it rotted before it could ripen," said Jeff White, owner and winegrower at Glen Manor, on the west-facing slopes of the Shenandoah Valley just south of Front Royal. "But we've learned to control the crop and leaf canopy to encourage ripening." White's 2007, still available on the market, shows the fat ripeness of a long, dry, hot growing season. The newly released 2008, on the other hand, was picked during the five-day window between tropical storms Fay and Hanna. A decade ago, that one-two punch from Mother Nature might have ruined the vintage, but with vine age and experience, White was able to produce a wine that not only tastes ripe and tropical, but also features the grassy edginess that characterizes the grape. So with sauvignon blanc, don't just think California. You might be overlooking a gem next door. Virginia Wins 12 Decanter Magazine Awards!!!! Virgnia Wines to London - Again!!!! New Horizon Wines Ltd, a UK and Virginia-based importer of exceptional ‘medal-winning’ Virginia wines into the UK and provider of luxury ‘wine lifestyle’ tours of Virginia, is exhibiting for the first time at this year’s London International Wine Fair (londonwinefair.com), in association with the Virginia Department of Agriculture and Consumer Services. This specialist company, whose founder and CEO is a Brit who has been living in Virginia for the past 20 years, will be presenting more than 30 of the best wines from this, the USA’s fifth largest wine producing region. New Horizon Wines will be joined at the exhibition on stands S24 and S22 by eleven independent wineries representing the Virginia wine regions, the largest number ever to participate in the LIWF. The following wineries and winemakers will be present: Luca Paschina, Barboursville Vineyards; Chris Blosser, Breaux Vineyards; Jim Corcoran, Corcoran Vineyards; Chris Pearmund, Pearmund Cellars; Justin Bogaty, Veramar Vineyards; Andrew and Patricia Hodson, Veritas Vineyards; Tony and Edie Champ, White Hall Vineyards; Matthew Meyer, Williamsburg Winery; DelFosse Vineyards, Keswick Vineyards and Rappahannock Cellars. Over the past 30 years the number of wineries in Virginia has grown from just a handful to more than 150. 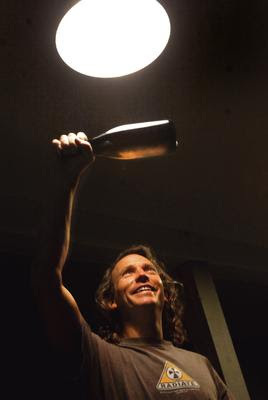 Some are gaining an international reputation for the excellence of their wines. Many wineries are family-owned and set in stunning locations such as the Blue Ridge Mountains, the verdant beauty of the Shenandoah Valley or on the sparkling Chesapeake Bay. This is the perfect foil for participation in a wide range of grape-harvest festivals, special tastings, musical and culinary events and experiencing wine trails across the Capital Region. 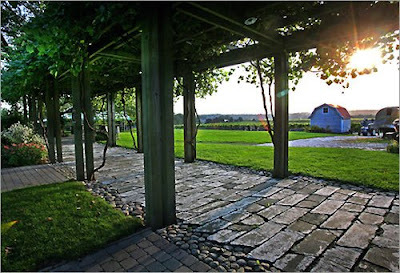 A new website called MyCapitalGardensUSA.co.uk showcases a collection of Virginia wineries and provides visitors with the opportunity to win a fabulous 11-night holiday for two to the Capital Region (closing date 31st May 2009). Trade visitors to the London International Wine Fair will have the opportunity to enter the prize draw. New Horizon Wines, in partnership with specialist UK tour operator, America As You Like It (americaasyoulikeit.com) offers tailor-made fly-drives to Virginia and can arrange Wine Experience holidays, including wine tastings, behind-the-scenes vineyard tours, wine pairing dinners and more. A seven-night fly-drive to Virginia, including two nights at the Loews Madison in Washington, DC, three nights at Keswick Hall near Charlottesville, with a select wine tasting at Keswick Vineyards and two nights at Wedmore Place in Williamsburg with a tour and tasting at the Williamsburg Winery, plus return flights on Virgin Atlantic from Heathrow to Washington Dulles and seven days’ compact car hire, start from £1,320 per person. Wine experiences (other than the tastings mentioned) are additional and can be designed to suit individual preferences. New Horizon Wines will be posting a daily blog from the floor of The London International Wine Fair - winesofvirginia.blogspot.com/. Also visit NewHorizonWines on twitter.com. For further information about wines and travel to Washington, DC, and Virginia visit capitalregionusa.co.uk and newhorizonwines.com. The DC Wine Examiner is tohewise known as Dawn Mayhew Merritt. She is a native Virginian, communications professional and self-described wino. Her philosophy: “Think globally. Drink locally.” She loves the quality and variety of Virginia wines, but is willing to try anything. She's great at poointing out wine and especially vineyards in the Capitol refion. Does your bank account balance have you staying home this Memorial Day weekend? Fill your “staycation” with great people, great scenery and great wines in Virginia. One of the latest additions to the local wine scene, Barrel Oak Winery (BOW) is all about community. Whether it’s encouraging groups to visit and picnic for the day or raising money for charity ($30,000 in their first year! 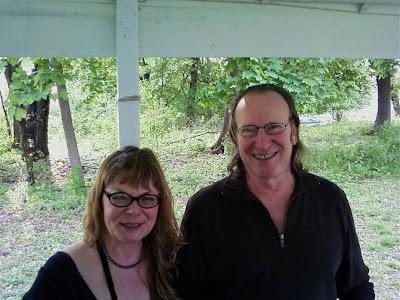 ), owners Sharon and Brian Roeder are reinventing the concept of local winery as a destination. This weekend, Barrel Oak celebrates its one-year anniversary with entertainment, the release of two new wines, the opening of a dog photography show, special tastings and tours. And the weather should be perfect Saturday and Sunday for the opening of their patio tasting bar. Free entry to monthly Second Saturday club events with owners Sharon and Brian, which include tastings of pre-releases and fine foods. Spacious indoor and outdoor seating: Tables and chairs downstairs. Comfy sofas upstairs. Picnic tables outside. Plentiful powder rooms: Three lovely water closets indoors. (Clearly this is more critical for women than men! )Pet-friendly atmosphere: Dogs are welcome indoors and out, as long as they are leashed. Romance: Plenty of spaces to get away from the aforementioned kids and dogs, either upstairs in the lounge or outdoors. I’ll have details for you next week from my interview with Barrel Oak owner Brian Roeder. In the meantime, grab you dog, your kid, your friends and/or your honey and go BOW this weekend. Westport — .Vineyard manager, alchemist and fortuneteller. Rob Russell has donned all those hats and more as Westport Rivers Vineyard and Winery celebrates the 20th anniversary of its first vintage, the 1989 chardonnay. “We’ve proved that we can produce world-class wines in New England,” said Russell, general manager of Westport Rivers Vineyard and Winery. Twenty years later the lauded chardonnay is still its most popular wine, but the vineyard’s sparkling wines may rival it for garnering the most acclaim from chefs, critics and industry experts. Russell said noted chef Madeline Kamman visited the vineyard several years ago and said the sparkling wines were better than many of the champagnes in France. “They’re always a favorite at sparkling wine competitions,” said Russell. Westport Rivers’ rose and white sparkling wines are produced in the traditional French champagne method, and the varieties they make take between three to 12 years. One of the greatest lessons Russell said he has learned over the years is the law of supply and demand. “We’ve overproduced and we’ve underproduced. I need a magic ball to determine what the demand is going to be five years from now,” he said. 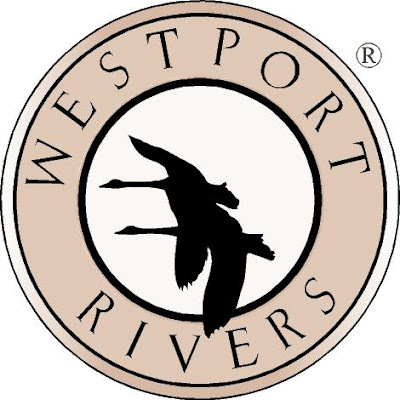 Westport Rivers non-sparkling wines include pinot gris, reisling, pinot blanc, pinot meunier, Rkatsiteli, a Georgian varietal that grows well in this area, and the fruity dessert wine pineau de pinot. Russell’s parents, Bob and Carol Russell, bought the former Smith’s Long Acre Farm in 1982 with the intention of maintaining the 140-acre farm and establishing a family business on the property. Rob, the oldest son, began farming the land in 1985 and his brother Bill began making wines a few years later. Over the years Bill developed an interest in brewing beers, and he started brewing micro brews under the Buzzards Bay label in 1998. The original 140 acres has increased to more than 500 acres through subsequent land purchases. In the past 10 years the vineyard has moved toward more environmentally friendly farming. 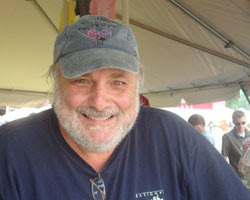 Russell said he became more aware of the issues of sustainability after attending several conferences on organic growing practices in the late 1990s. But he said excessive humidity and rain make it virtually impossible for a vineyard east of the Mississippi River to produce organic wines. Russell said he’s implemented some of the concepts, but the two main hindrances are the pests and mildew fungi resulting from New England’s climate. The vineyard uses composted material and practices Integrated Pest Management, which minimizes the amount of chemicals used over the growing season. Hooded sprayers that direct the pesticides and fungicides directly on the plants also cut the drift of chemicals by 95 percent. Finding that environmental balance is one of Russell’s main initiatives as he embarks on the next 20 years. “I want to continue what we’re doing but find ways to do it better. We’re always striving to find the balance between economic viability and environmental sustainability. The rise in eco-tourism has been a boon to the vineyard, drawing customers who attend the vineyard’s tours, wine tastings, and wine and food pairing dinners. “All of those things help sustain this,” he said sweeping his arm over the trellised vines. TRENTON — Legislation Assemblymen Nelson Albano and Matt Milam sponsored to promote New Jersey wineries by declaring November as “New Jersey Wine Month” was signed into law on May 6. New Jersey is the fifth largest producer of wine in the country, and the winemaking industry contributes approximately $1.3 million each year to New Jersey’s economy. Wine produced in the state continues to be recognized and win awards both nationally and internationally. There are three wineries in Cape May County: Natali Vineyards, in Goshen; Cape May Winery, in Town Bank; and Turdo Winery, in North Cape May. New Jersey is host to more than 30 wineries in nearly every county, cultivating more than 40 varieties of grapes and producing more than 100 different varieties of wine. New Jersey’s agriculture tourism is enhanced by the estimated 235,000 visitors who annually attend events and festivals hosted by the state’s wineries Albano and Milam said the law will help recognize the importance of wineries to the state. “New Jersey will be better able to promote wine tourism and improve sales and awareness of New Jersey wines, wineries and vineyards,” Milam said. HARRISBURG, Pa. (May 1, 2009) – With vacation budgets shrinking, it might not be the right time for that seven-day cruise or trip to Australia, but Pennsylvania’s wineries and other local attractions are raising a glass to a different type of get-away: The regional mini-vacation. In what is predicted to be a busy 2009 for the state winery industry, the Commonwealth’s vintners expect an increase in tourism traffic, as residents and out-of-state visitors search for closer, more affordable destinations with all the excitement and stress-relieving benefits of traditional vacations. To create more enticing holiday hideaways, some wine makers are going beyond the usual wine tastings and tours by expanding their event calendars and rolling out the red carpet for would-be guests. Upcoming attractions throughout the state include a series of winemaker’s dinners at Arrowhead Wine Cellars outside Erie, a Wine Tasting for Singles event at Crossing Vineyards in the Philadelphia countryside, and a summer concert series at Lancaster County’s Nissley Vineyards. In 2005, the last year that totals were reported, 877,000 visits were made to Pennsylvania wineries with $167 million in tourism expenditures. Sam Landis, president of the PWA, which counts nearly 100 wineries as members, says state winery traffic could top one million visitors in 2009. Pennsylvania is the nation’s eighth largest wine producer, with approximately 919,950 gallons produced in 2007. 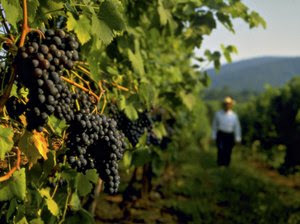 For more information about Pennsylvania wineries, visit pennsylvaniawine.com. Sorry, I'm a little late on this. My apologies! Congrats to Benigna, Greendance, Flickerwood, and all the rest. 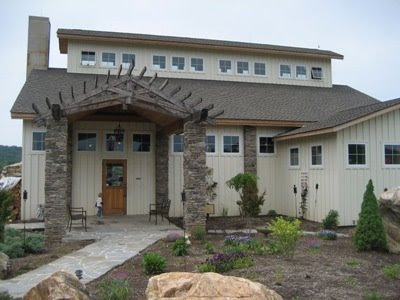 For twenty one years, Bert and Lynne Basignani and their children have been growing and making variety of exceptional wines on their vineyard located off Falls Road in Sparks, Maryland. The pure love of drinking wine was what brought Bert’s curiosity to make his own wine to drink as an amateur. After a successful career in the construction business, Bert decided to begin a winery. The grapes were planted nine years prior to the winery opening in 1986. 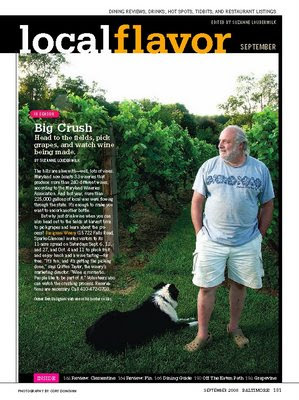 The Basignanis were encouraged by other Maryland wineries and friends to continue their growing and winemaking. “We became caught in the whole aspect of making it and starting up the winery, but people were interested,” Lynne says of she and her husband turning their interests into a lifestyle and career. Each year, Bert produces 4,000 cases of wine. On the 18 acre vineyard, Bert grows a variety of different grapes that produce eleven different varieties of wine. Bert manages two vineyards off-site, allowing for many more winemaking options. Along with Bert’s favorite, Cabernet Sauvignon, he also makes Merlot, as well as three sweeter wines, Riesling, Vidal and Blush. The Basignanis have created four wines named after their children, one white, Elena and three reds, Marisa, Lorenzino and Erik's Big Zin. One of the best kept secrets of these major wine festivals is how much time and energy they save you. Just think of having to drive from Deep Creek Lake in far-western Maryland to the Eastern Shore and Southern Maryland to visit every winery. The festivals bring Maryland’s finest wines to your backyard, saving you a couple tanks of rather expensive gas. And since many of the wineries offer special festival pricing, you can use that saved cash to take home a few bottles of your new favorite wines. Can you think of anything more fun and enjoyable than spending a beautiful sunny day on the sandy shores of the Chesapeake Bay sipping wine? We can't either, so plan to join us at the 2nd Annual Chesapeake Bay Wine Festival held at Terrapin Nature Park in Stevensville. Celebrate Maryland wine with tastings from the wineries, culinary favorites from local restaurants and caterers, handmade crafts, and live jazz, blues and oldies music on two stages. Admission includes souvenir wine glass and ten tastings. Tickets are available online at www.uncorkthefun.com or by calling 800-830-3976. 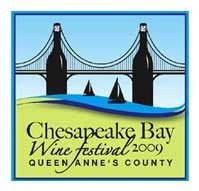 See all the details of the State's oldest and largest wine festival at marylandwinefestival.org. This festival is set on the historic grounds of Historic Sotterley. More information is available at www.sotterley.org or 301-373-2280 or 800-681-0850. Blues Music by Blue Streak Rhythm & Blues, Skyla Burrell Band, Ursula Ricks Project, Twine Time and Automatic Slim. For More Information call Ellen Richards 703-481-6525 or elensrich@aol.com, or Sharon Miller 410-391-2251. Tickets are $20 in advance/$25 at door. The event will feature wines from Maryland wineries, as well as local cuisine, juried arts & fine crafts and live entertainment. More information is available at www.autumnwinefestival.org/ or by calling the Visitor's Bureau at (410) 548-4914 or (800) 332-TOUR. Cereghino Smith Winery - A Great Find! 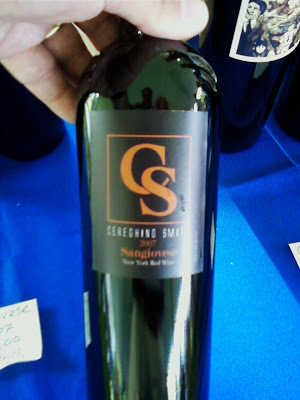 Cereghino Smith is a small, artisanal winery producing hand crafted wines. Paula Cereghino's and Fred Smith's grapes are sourced from small growers in California and New York. They do small, handmade lots. Small runs. And they are very nice quality. They were recently featured in Chronogram magazine. I have been trying to catch up with these folks for quite a while. Dominique, my wife, had met them at a tasting at Partition Street Liquor Store last year, but I did not. The do not have a tasting room, so you have to find them at a tasting, a retail shop, or a wine festival, or some other special event. I finally found them at the Rip Van Winkle Wne & Cheese in Catskill on May 9th. They are very nice poeple, and they are tryign so hard to make truly hand crafted wines here in the Hudson Valley. They use a combination of California and New York state grapes. But everything is made at their place in small batches. Happily, I tried several wines. An amped up blend of 60% Mourvedre, 25% Petite Sirah with 15% Sangiovese adding bright acidity and balance... notes of tea, spice and electric prunes. Filtered only by time and gravity. I loved this wine. A fabulous, dry, deep, robust wine. Very, very good. Prune and tea come through. Very nice finish. Excellent! 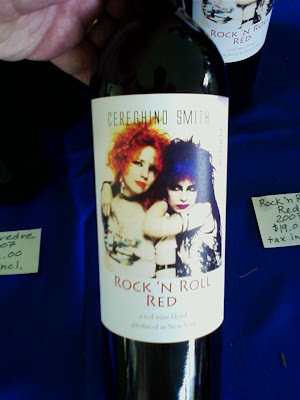 The label features their friends Tish and Snooky...sisters, singers and creators of Manic Panic. Oak for 11 months. Fined not filtered. Limited production of 180 numbered bottles. Vry Brunello like. Nice bright color. Deep cherry flavor. Nice dry finish. Also an excellent wine!!! Great stuff! Call them go to their website. Nicer people you won't meet. A great wine! HUDSON VALLEY, NY, MAY 1, 2009 — A Quadricentennial Commemorative Wine Label will brand special 2009 releases of Hudson Valley wine to celebrate the 400th anniversary of the discovery of the Hudson River. Participating Hudson Valley wineries will release one red and one white wine made from 100% Hudson Valley-grown grapes or fruit to commemorate the year-long celebration. 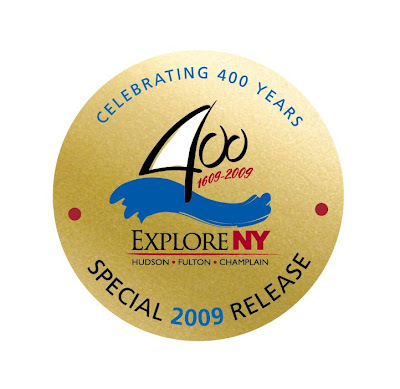 These special gold labels are emblazoned with the Hudson-Fulton-Champlain Quadricentennial-themed logo, “ExploreNY400” and will help to place a spotlight on the contributions the region has made in the world of viticulture since its earliest origins. Tourists can visit the wineries or attend one of the many wine events around the region this year and take home a souvenir of the Quadricentennial in the form of a bottle of locally-made wine. 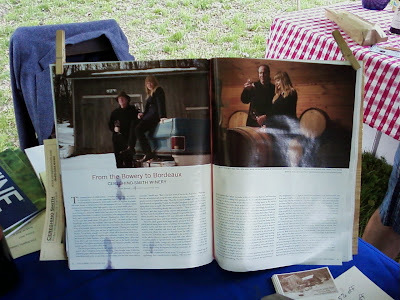 More information about the labels and the winemaking history of Hudson River Valley can be found in the Spring 2009 issue of Hudson Valley Wine magazine or online at www.hvwinemag.com. The Hudson River Region is one of nine designated AVAs (American Viticultural Areas) in New York State, and is the oldest winemaking region in the country with its grape growing origins dating back to the discovery of the river by Henry Hudson in 1609. Hudson remarked on the abundance of native grapes and fruits growing alongside the banks of the River during his maiden voyage and shortly thereafter, early settlers were encouraged to grow grapes to make wine. The earliest vineyards in the country are attributed to the French Huguenots who settled in present-day New Paltz, Ulster County. There are now over 30 wineries located in the region on both sides of the Hudson River, with the oldest winery, Brotherhood Winery, remaining the oldest winery in continuous operation in the United States. This year, 2009, marks the 400th anniversaries of the voyage of English Captain Henry Hudson, who led the first European expedition to sail up the river that now bears his name, and the voyage of Frenchman Samuel de Champlain, the first to discover the namesake lake. To celebrate these simultaneous 400th anniversaries – as well as the 200th anniversary of Robert Fulton’s maiden steamboat journey up the Hudson River – New York State is planning a yearlong series of events, programs and projects that highlight the discovery of New York, celebrating the State’s Dutch, French and English roots and heritage. For more information go to www.exploreny400.com.